Frustrated by the lack of available support for herself and others experiencing disordered eating, Ashley decided at the age of 17 to study psychology so she could help others as she wished she had been helped. 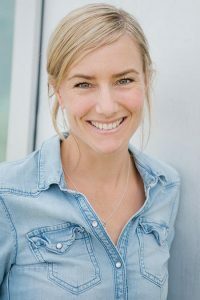 At the University of Victoria she tailored her psychology degree to the subject of disordered eating, and presented workshops to elementary and high school students with the BC Eating Disorders Association. She then became a certified nutritionist and life coach and, until 2013, had an active private practice helping individuals heal their relationships with food and themselves. As a member of Saleema Noon’s team since 2010, Ashley has used her expertise to update the self-esteem and body image modules for iGirl, as well as help create and launch iGuy. In 2017, she created iKid Empowerment Workshop to bring the powerful iGirl and iGuy messages to younger children. As a facilitator, her success in helping girls develop a positive self-esteem is made possible by the fact that she is approachable, she knows that girls learn better when they’re having fun, and most importantly, she has been there. We are grateful to have Ashley as our Empowerment Program Director. And her daughter and son are grateful to have her as their Mom!